tvONE has released two new modules for CORIOmaster systems, the new streaming media and 4K playback input module (CM-AVIP-IN-1USB-1ETH) and new 4K HDBaseT input module (CM-HDBT-2IN-1ETH). The new CORIOmaster streaming media and 4K playback module allows digital video from the cloud or the internet to be blended with local media and AV connections and presented together on a video wall in any desired configuration. Compatible with the CORIOmaster, CORIOmaster mini and (coming soon) CORIOmaster micro, the innovative module offers dual-channel 1080p60 streaming media as well as file playback, via USB3.0, of any resolution up to UHD/4K on the main channel and 1080p/60 on the secondary channel. Features include onboard 16GB storage for video/still playback, expandable to 128GB. "CORIOmaster is the industry's most versatile standalone video processor and the new module adds another powerful arrow to its quiver,” said Andy Fliss, EVP of sales and marketing, tvONE. “Streaming has become a vital communication tool for businesses and organizations, and we're adding a world of new possibilities for CORIOmaster users. The CORIOmaster 'anything in, anything out' capability now encompasses streamed as well as locally stored content." 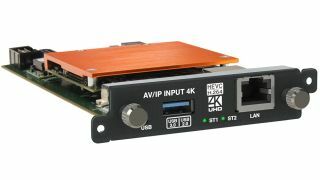 The 4K HDBaseT (dual) input module allows for the input of uncompressed, high-resolution 4K video and audio from standalone transmitters located up to 150m away. The HDBaseT input module also allows for Ethernet to be accessible from distant transmitters. This module can be used with transmitters that support HDBaseT, HDBaseT-Lite, and HDBaseT-Extended mode. In addition to the shipment of the new streaming media and 4K playback input module and HDBaseT input module, the company has added to CORIOgrapher v2, CORIOmaster, CORIOmaster mini's and (coming soon) CORIOmaster micro's creative video wall design software. CORIOgrapher v2 now supports streaming video and playback of 4K files and 8K still images. Now, when using tvONE's CORIOgrapher v2 design and control software, users can mix streaming video with 4K files and still images into a single playlist, all from a CORIOmaster.